Jonge Poerink Conveyors > Four elements one conveyor! 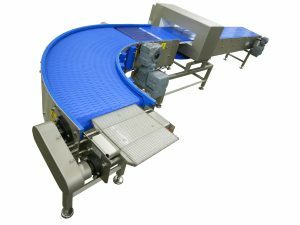 The products from the Jonge Poerink Conveyors line are made to connect perfectly. At the front you will see the Cleatrac which is very suitable for the food industry followed by a strong Puma curve. Behind our MP transfer that fits well with our straight KPA conveyor. With different elements the perfect conveyor. A metal detection system is installed above the conveyor. A good example of how flexible you can be with only our standard products.